Modern motorcycle manufacturers have to comply with stringent noise emission regulations. This problem is much easier to overcome with water-cooled engines as they have the water filled jacket wrapped around the cylinders/heads of the engine and this absorbs and baffles a fair amount of engine noise. The Triumph 790/865 twins are blessed with a beautiful air cooled engine and are inevitably noisier. Triumph have designed the engine with this in mind and added rubber soundproofing in the clutch casing to reduce clutch noise and anti-backlash gears on both camshafts which significantly reduce top-end noise, but further noise reduction is still required to pass the noise regulations. So, if Triumph can't dampen the engine noise any further, they would need to reduce noise from other areas. There are two obvious areas where noise reduction can be achieved relatively easily if you're not too concerned with performance, the induction and the exhaust systems. Triumph did a typically efficient job on both. The Triumph twin airbox design is an excellent noise baffle device which holds the air filter and delivers air to the engine in the quietest possible way. The internal "baffle" and the external "snorkel" of the air box reduce induction roar to a whimper. The factory silencers are extremely quiet, annoyingly so to many owners and replacement is usually one of the first modifications a new owner will carry out to his bike. But if extreme noise reduction is what's required of Triumph to get the air cooled twins through the rigorous manufacturers noise emission tests, then they did an excellent job and we have our beloved twins. We have instructions on how to remove the internal airbox baffle HERE and our testing on air filters HERE had determined which filters to use. So, on to number 1, the replacement of the airbox cover/snorkel. 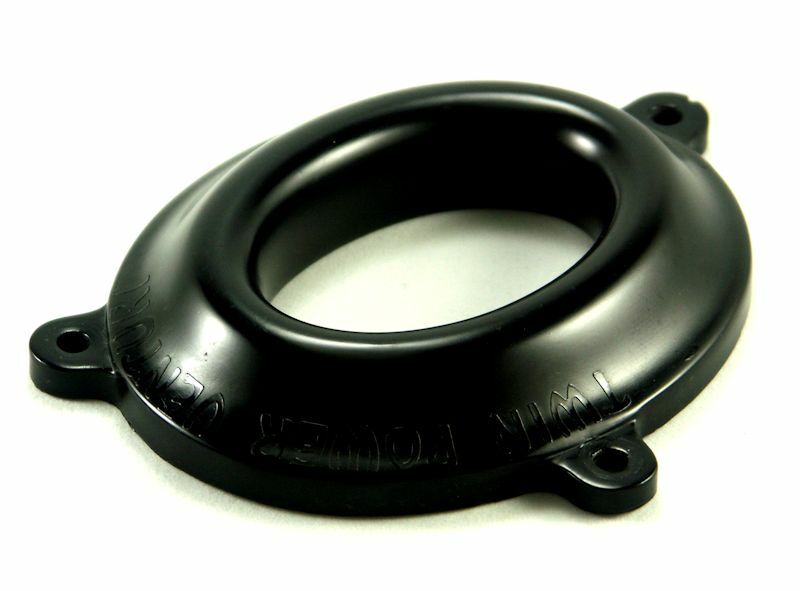 The Triumph Twin Power "Breathe" airbox intake cover was designed and developed to be extremely free flowing and give the least amount of resistance to the air being sucked in to the airbox and through the filter, thereby giving the engine a chance with correct fuelling to produce as much power as possible from the given airbox design. A cover that reduces restriction and increases airflow as much as possible. 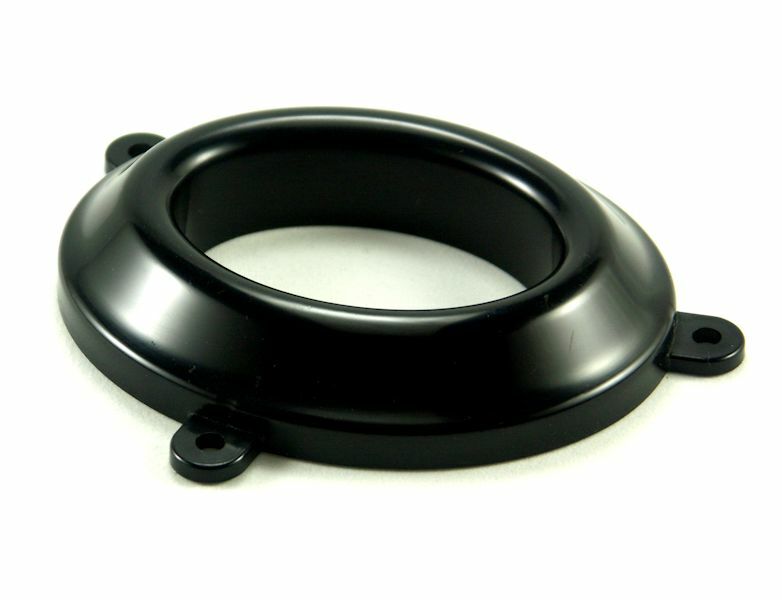 A cover that was durable and was a direct replacement of the OEM unit, so it could be easily installed. A cover that was the same weight or lighter than the OEM cover/snorkel. A low profile cover that reduces restriction and increases airflow as much as possible. 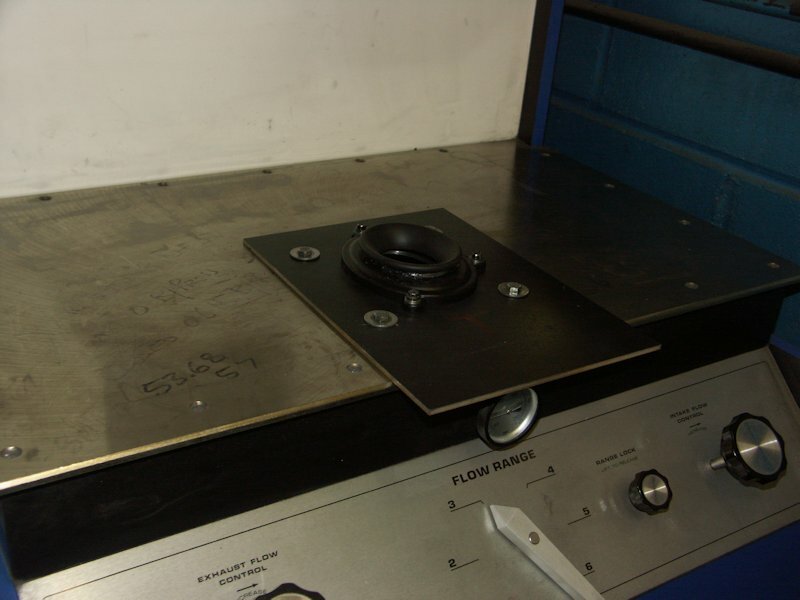 The base of the unit was the easiest part of the design as it only had to emulate the OEM cover. Three lugs for the bolts to secure it to the airbox and an inner profile that maintained a good seal and held the air filter in place. 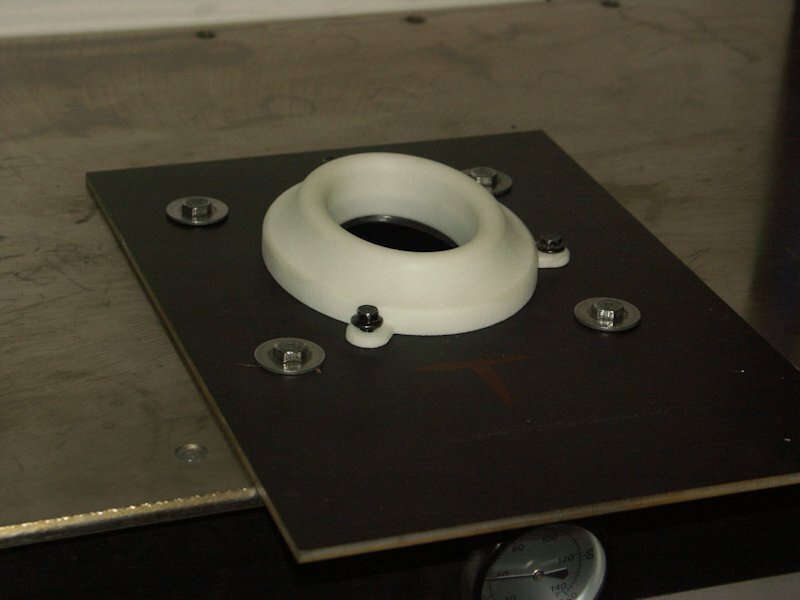 So the base of the initial prototype was CNC'd in aluminium with a flat top similar to the OEM cover with the snorkel removed, but with a larger central hole so it wouldn't restrict flow. This base could then be built upon with modelling clay to test various designs on a flow bench. 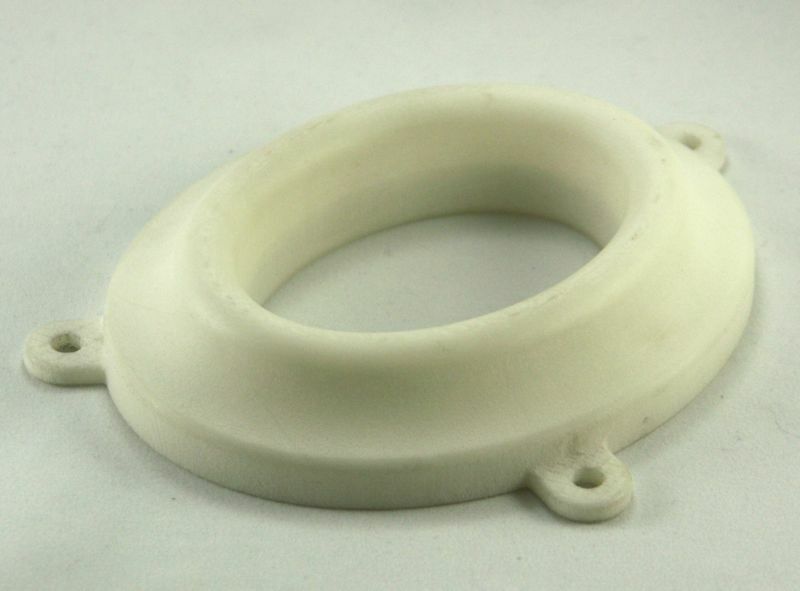 The final design was made in to a mould, filled with car body filler and attached to the base to give a hard design that could be used in real world road testing on the bike. The hard design could then be changed if needed, in a subtle way by sanding. As the design moved on we wanted to see how the finished item would look, feel and perform in plastic. So we used a silicone medium to make a mould and then used a syringe to inject cold liquid plastic in the mould. This DIY solution was fraught with timing problems. If too long was taken, you would end up with a solid syringe. This process was time consuming, extremely messy and costly, but we did succeed. We ended up with one very good example which gave us exactly what we wanted, a realistic prototype for road testing. 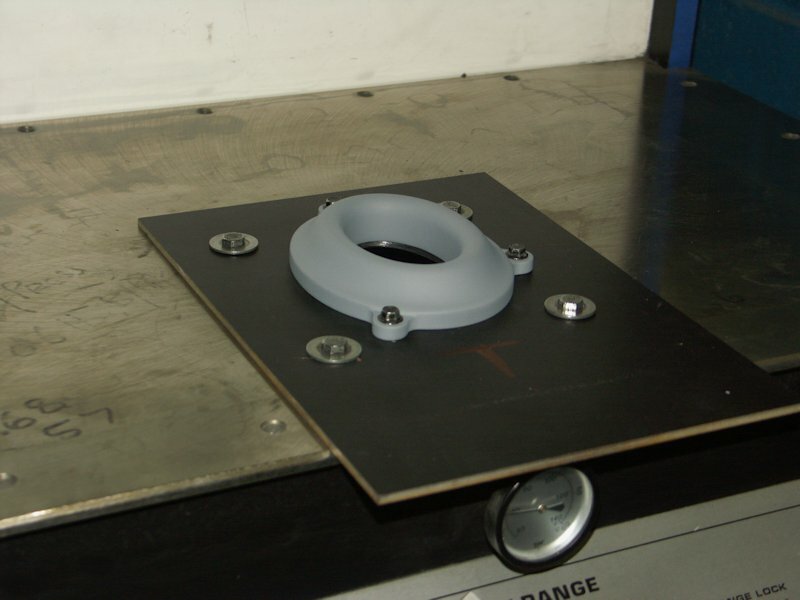 Once the design was transfered to CAD, we tried a slight modification to the design and then fast prototyped it. 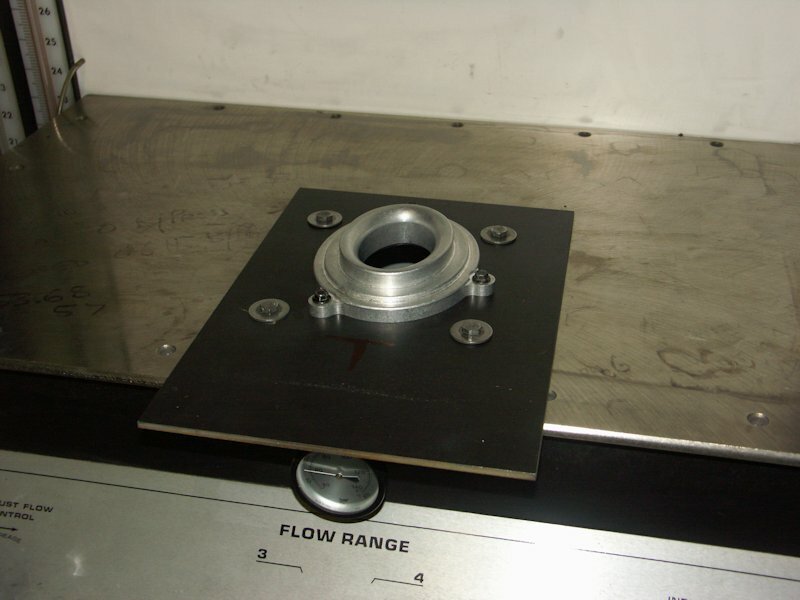 The fast prototype was sanded to smooth a finish and then flow tested on the flow bench. The changes yielded less than nothing, so we went back to the original CAD design. 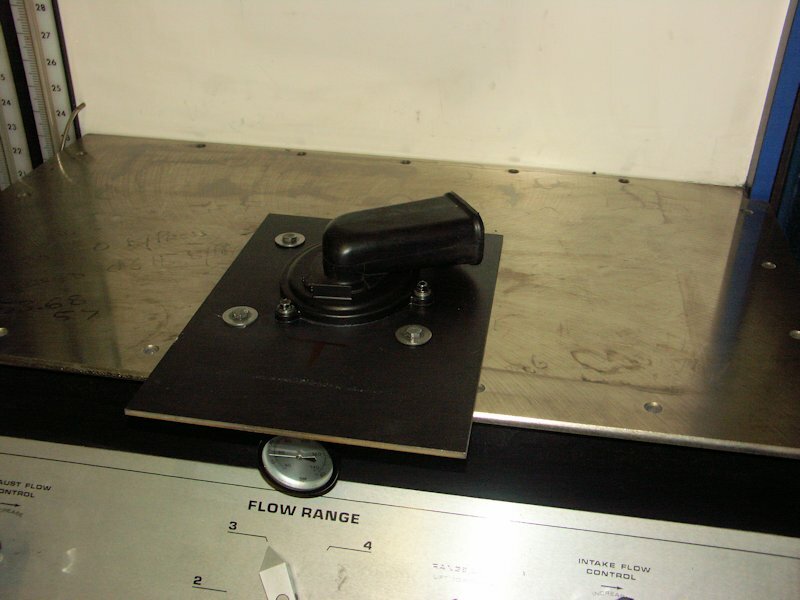 We carried out air flow testing on a SuperFlow SF-600E flow bench. All the covers were tested, starting with the OEM cover with snorkel through to the final Breathe product, and the figures speak for themselves. 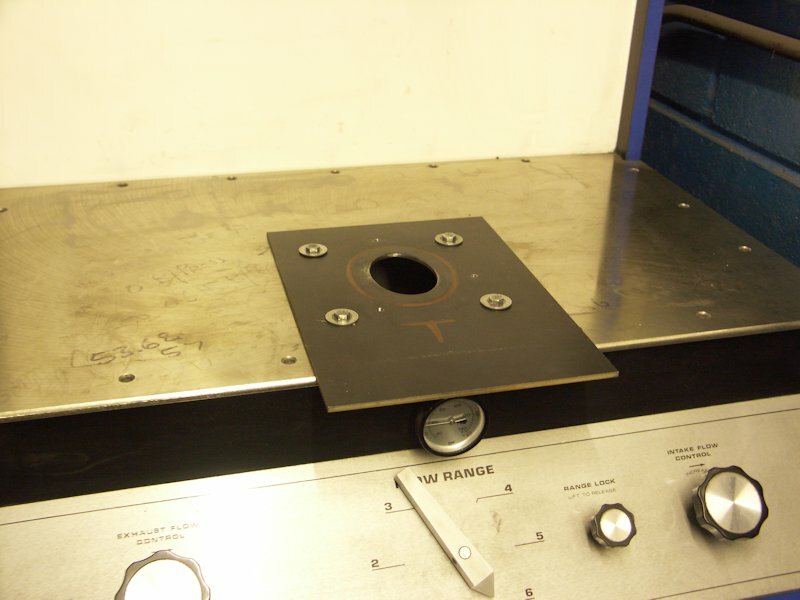 The stand alone test jig was made from steel plate with a hole cut into it exactly the same size as the inside of the factory air filter and three threaded holes to secure the covers. 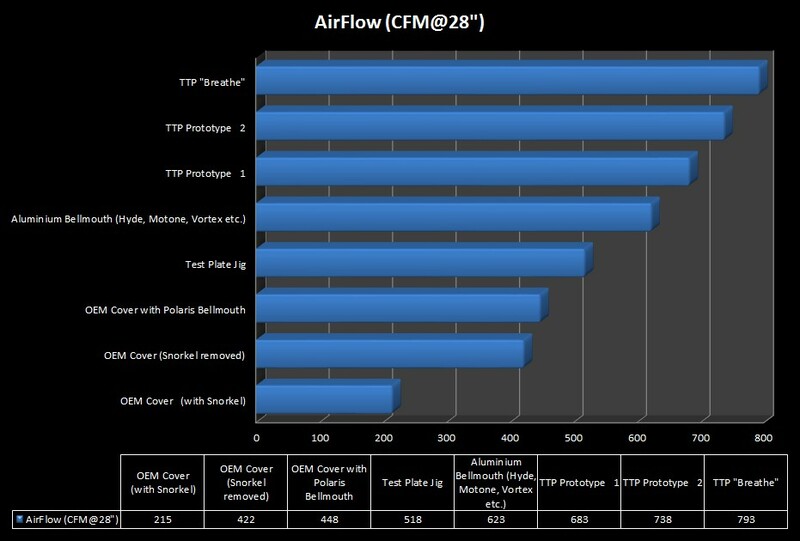 The flow rate of the base plate on its own was 518cfm @28" H²O and the final Breathe design improved airflow over and above the stand alone base plate by 53% and 368% over the OEM cover/snorkel. We know that we have developed and produced an airbox intake cover that will be hard to beat with regard to air flow ability. 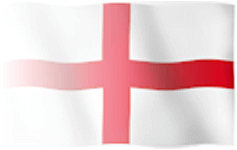 It fulfils all four parts of our design criteria completely. 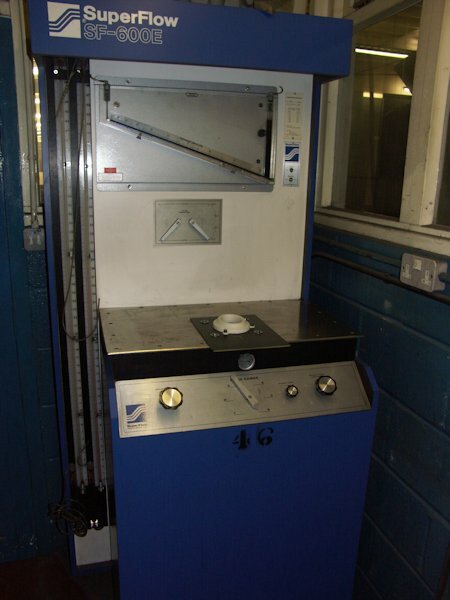 Have a look at the dyno charts on the right, they show various comparison traces. The first dyno is of an EFI 865 Bonnie with the engine in factory spec and Staintune reverse cone silencers installed. This has been compared with the same bike, but with the Breathe air intake cover, DNA filter and TTP EFI tune. 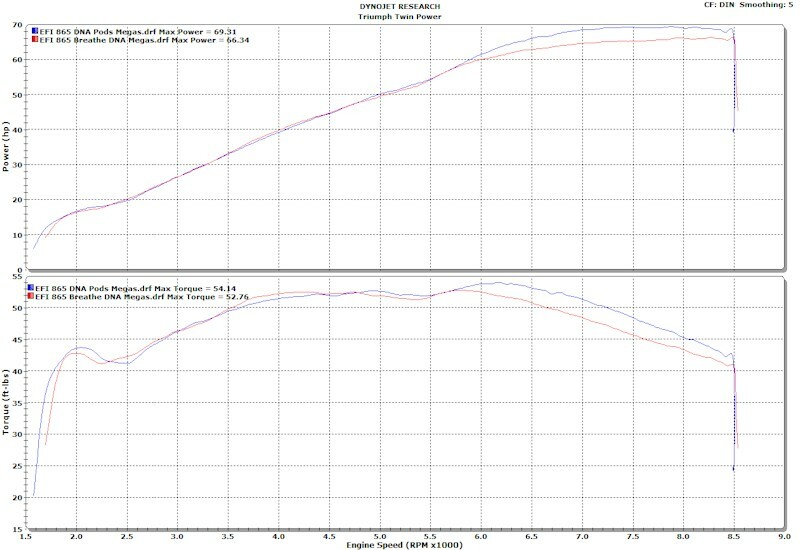 The dyno traces show an excellent mid range boost of 14% torque. The convergence of power and torque at around 6,500rpm is due to the air box baffle stifling performance. 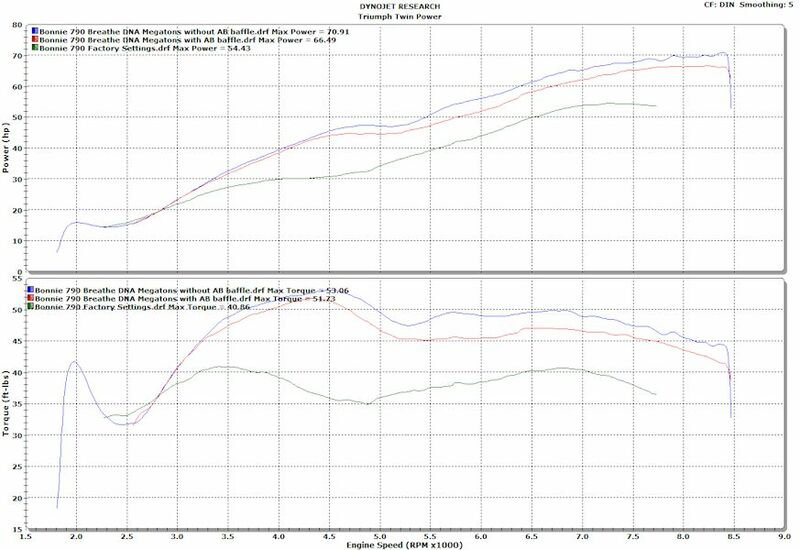 The second dyno trace is of an EFI 865 Bonnie running the Breathe intake cover, DNA filter, reverse cone mega silencers and one of our EFI tunes. It's compared to the same bike, but with the airbox removed and DNA pod filters installed. The dyno shows the two configurations are near enough neck and neck for power and torque up to around 6,000rpm and then the traces start to diverge as the pod filters ability to flow more air comes to the fore. It also shows a slight advantage between 3,500 - 4,500rpm of around 1ftlb of torque in favour of the airbox over pod filters. The final dyno graph shows the potential of the 790 engine with just a few modifications. The traces are from an OEM factory bike, and then two traces from the same 790 bike, the first with a TTP Breathe intake cover, DNA air filter, TTP Ignition Advance, megaphone reverse cone silencers with the airbox baffle installed and the second is the same configuration, but without the airbox baffle removed. 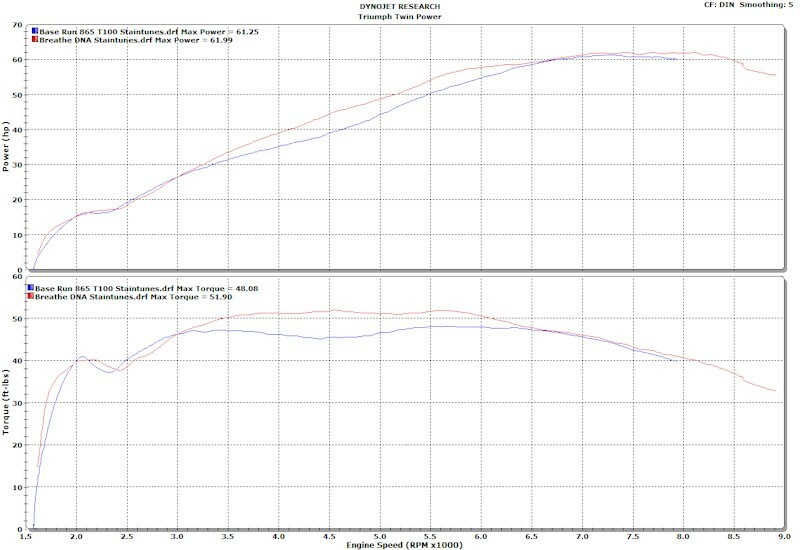 The dyno chart shows that the OEM 790 gave 54.43bhp and 40.86ftlb at the rear wheel and when modified as listed above with the airbox baffle removed it gave 70.91bhp and 53.06ftlb. This is an increase in both peak bhp and torque of around 30%. Even more impressive is the mid range torque increase, this is the rev range you use the most in every day riding. The dyno graph shows that at 4,500rpm the OEM bike is producing 35.8ftlb and the modified bike is producing 53.05ftlb, this is a massive increase of over 48% right where you need it. We think this is an excellent £$£$ per bhp improvement.